Listen To Your Body… Before Gluten Does You In! I’ve taken a long hiatus from blogging and with good reason. The last week in August I tripped over a stone in a parking lot that should have been removed years ago and wound up in the hospital for two days with a moderately severe concussion and five staples in my head. I had no recollection of the ambulance, the emergency room, or the concern on the faces of my family as I repeatedly told the doctor how good-looking he was and that he seemed too young to be a doctor. All the family were around as the next day our kids were planning a big surprise 50th for my husband and me. Needless to say, “I didn’t make it.” I hear it was a great party. I knew how important it was to have little to no visual stimulation so I spent 3 ½ weeks on the coach with no TV, videos, or books and wore sunglasses and a cap to keep the light down. After a week, books-on-tape and friends got me through the next 2 ½ weeks. My husband was a peach tending to my needs. After 3 ½ weeks I slowly got back to using my mac and some reading. Fortunately, the neurologist found nothing out of the ordinary on all the tests and I was given the ok to venture to the Far East on a trip we had planned. I managed to keep up with the group fairly well, but opted out of a few adventures that would have been too taxing. My balance was still somewhat off, but manageable. We arrived home just prior to Thanksgiving and I had to put extra holiday time into the Clever Hand Gallery, an artisans’ co-op in Wellesley that I belong to. Then there was shopping, cleaning, and decorating for our own Christmas holiday party with the whole extended family that we have hosted for close to 50 years. It was taxing, but I got through it. We wound up going out for New Year’s Eve for a quiet dinner with great friends. On New Year’s Day my youngest daughter who is a captain called and asked if I’d like to join her on a trip to see the northern lights. When she’s not working she’s apt to be flying somewhere in the world. I felt as if I’d been on a rollercoaster for some time and that I needed to rest. Listening to my body, I reluctantly refused this lovely invitation to spend time with my daughter to stay home to rest and recoup by the wood-stove. Of course, my husband doesn’t let an opportunity slip by so he went and they had a lovely father/daughter connection even though it was overcast and they didn’t see the lights. I feel that my balance improved over this quieting stretch. This story may seem unrelated to my topic of gluten, but it isn’t. First, I expect that being gluten-free may have played a huge roll in the health of my brain and neurons and in my quite successful recuperation. Aside from a balance issue I didn’t seem to have any other serious symptoms that can be associated with a moderately severe concussion. Gluten is a sticky protein in wheat and is linked to many cerebral and neurological disorders. Not having a body full of this hazardous protein destroying the intestinal villi that absorb nutrients to keep the brain/body healthy undoubtedly helped with healing. Second, I finally listened to my body that was screaming at me to rest. Many of you reading this blog may manifest subtle to more troublesome symptoms and maladies/diseases linked to gluten that can affect any part of the body. There comes a time when you need to stop ignoring and start listening to your body before life gets worse, especially if you want to avoid the slippery slope of aging. You need to realize that your ailments, no matter how seemingly subtle or problematic could very likely be linked to gluten. The following are just a few symptoms that you may think are a normal part of life (they are not; something is causing them): dry skin, chicken elbows, mouth sores, reflux, rashes and other skin conditions, brain fog, headaches, migraines, joint pain, dull flat hair, hair loss, splitting/weak fingernails, nail striations and white dings, irritability, moodiness, paleness, red face, weight-loss or weight-gain, fatigue, depression, sickly, allergies, asthma, bleeding gums, most any gastrointestinal ailment, etc. For many more gluten-related issues see the Toxic Staple Table of Contents at: http://toxicstaple.com/wp-content/uploads/TS-TableOfContents.pdf and sign up for the blog notification top right at http://www.toxicstaple.com for a free report and a list of 50 gluten-related symptoms and maladies. You will know people whose lives could drastically change if they address what’s making them so sick and tired. There are many very serious complications of celiac disease and gluten intolerance that you might avoid or ameliorate including cancer, autoimmune diseases, organ and glandular issues, blood and bone problems, pregnancy/fertility issues, and numerous neurological and cerebral ailments, all supported by easy-to-read research in the book. What may seem like a simple irritating symptom may be a sign of underlying mal-absorption or antibody activity that is slowly eating away at your body and your health. It would be important to address the matter before it gets worse, but you need to get educated and become your own advocate in working with your doctor. You need to request certain tests. Mainstream medicine is still in the early stages of awareness (mostly unaware) of the devastating issues linked to gluten and how to detect intolerance. Listen to your body if you have any chronic symptom or disease. Do not delay in getting tested for celiac or gluten intolerance. This intolerance is too serious to just “try” the GF diet. You need to know if you are intolerant then pay close attention to the GF diet. Get educated so you can advocate for yourself. It is a must! 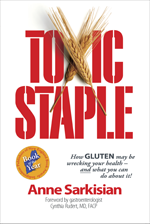 Unfortunately, mainstream medicine blood testing is not that reliable that’s why I wrote Toxic Staple. I spell out four blood tests and very sensitive stool testing that will nearly 100% get an answer if you are intolerant to gluten.